I was almost a young mother 1995 when Pope Paul II visited the Philippines. Much as I want to see him, I was pregnant at that time and my husband would not allow me to risk any mishap alongside thousands of devotees. We later found out. Not thousands but millions. After 20 years, another Pope set foot to the country. I have been another person too. A lot has happened in 20 years. But that’s such a long story to tell. To write or to blog about him, I would not want people to think that I’m riding on the Pope fever more so on his popularity. I just had this genuine need to speak of him. His Holy presence for me is the nearest thing to hope, love, world peace even heaven… Imagine more than 7 million people flocked just to see him. I saw him too. Just on TV. I looked forward to witness the charming smile that I’ve been hearing for the past days. And then I did. It was that time when he was still inside the airplane and peeking from the window. I saw the famous smile. I could not explain how it affected me. All sorts of emotions were running in my veins. My heart skipped upon seeing him – smiling. Upon touchdown, I was not blinking trying to capture every move, every wave, every smile. It’s time to meet and greet. When I saw his face delighted at the sight of Cardinal Tagle. And when they embraced for seconds. Tears welled up my face. If I remember it right. I prayed for Cardinal Tagle during the last conclave. He was also very charming to me. Though we all know it’s not about that. It is more than that. When it was announced that an Archbishop from Argentina was elected as Pope. He was first from the Americas. Indeed, he was known to be a Pope of “Firsts”. During the announcement, I just thought it was not yet time for the Philippines to boast a Filipino Pope. Little did I know nor been interested to find out who became the new Pope. I only heard of him doing selfies. He must be a funny guy. I felt contrite of being curious and stirred only now because of his visit to the country. I even heard that he jokingly told the other cardinals that may they be forgiven by God after voting for him. The Pope has humor. The embrace stayed in my memory. It was like an embrace of seeing an old friend with gratefulness. He was here for 4 days and all I could do is monitor him on TV. Some friends of mine (gained my admiration for their enthusiasm) and asked me to go with them and see the Pope yet I opted to see him on TV. I haven’t had much hope of seeing him from afar if I came with my friends and cousins. I opted to see him from afar. The delight of my fellow Filipinos (friends included) who have seen him was more than enough for me. They were a part of those 7 million. They became part of history. What I owe to myself and to those friends who tried to convince me is that I earnestly contemplated on his mass. And to the Papal visit’s theme: Mercy and Compassion. Which I think I might not be able to do had I been on the streets, small as I was, I am 5 feet tall and 2 inches, the more I’d be frustrated and distracted at the same time seeing my fellow Filipinos in great admiration. Though believe me. If I see him up close, I had this feeling that I might just be able to see his aura. I had that capacity. Once. And since then I knew it could happen again. From my TV, He is beaming for me. It was auspicious that Archbishop Socrates Villegas called him our “sunshine”. For he really shines! His smiling brightly erases away each of our heartaches. If only for that very moment or if it’ll linger for the rest of our lives. We never know. I weep again and again. When he apologized to the people in Tacloban for seeing them not immediately. And he made it. No storm can stop him. At his age, at 78 years old, having just one lung as he had an operation years ago, everyone wondered where is he drawing his strength. I guess, we need not wonder. We know where. I weep because I promise to visit Tacloban too. It was my second home. Haiyan devastated me just as much as it devastated Tacloban. I have friends there. I’ve witnessed the beautiful people of Tacloban myself. I have kept good memories from that part of my country. During the tragedy, we lost our former cashier and her son. It was a relief that other of my friends there showed up on Facebook. Losing some, all we could do is pray. Still, I intend to keep my promise. I’ll visit Tacloban one day. The Pope was very inspiring. 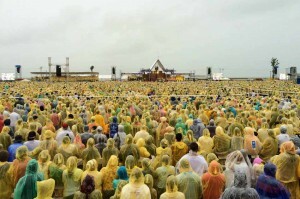 The tide of yellow ponchos was truly monumental. It gives me the cringe of witnessing a miracle. Millions of Filipinos whose heart are in sync of wanting to see Pope Francis. It was such a phenomena. The unsafe trip to and from Tacloban. I have never admired another personality like I did on this human being. For me, he was a female version of Mother Teresa. There were text brigades from everyone circulating on all networks to pray for the Pope’s safety. It was so impelling. I heard nothing but gratitude for his presence. Mostly, moments of bliss. Even these kids obediently wear these costumes as Swiss guards and while waiting for the Pope’s arrival had fell asleep. On the last mass he celebrated. I looked forward on receiving Christ as to how they are going to perform it, considering there are millions out there. Much to my surprise. Even if the church doesn’t allow it. Some said the Holy Eucharist was desecrated here, personally, I’d rather focus on the spirit of sharing. The bread of life were passed on from front to back by a laity(s). It was another scene that made me cry. It was selfless love. It was a spirit of sharing. Maybe, my take on it is the next time there’ll be a Papal mass and a huge crowd is anticipated, the logistics had to be well-prepared too. It was also said that it is the first time that we had a Pope named Francis. He had chosen this by his fealty to St. Francis of Assisi which is known as the Saint for the Poor. He was I guess an Art lover too. He was so moved by the Baroque painting of The Mary Undoer of Knots painting by Johann Georg Melchior Schmidtner while studying in Germany. He has been a devotee since then. This too has reminded me of Mother Mary, who have been my protector all of my entire life. 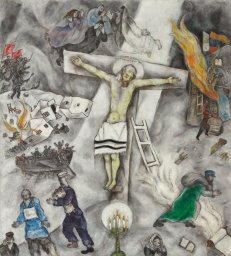 He is a fan of Marc Chagall. He has admired the “White Crucifixion”. We all know now that the Pope has a deeper capacity to understand people’s differences, more so not looking at the differences, but looking at everyone as children of God. He repeatedly said, we are created equal. 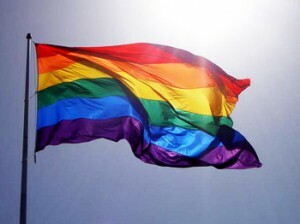 He also expressed a special understanding to the LGBT community. His humility is exceptional, he opted to stay at the guest house of the Vatican instead of the Apostolic palace, he cooks his own meal, rode the train, and kissed twelve AIDS patients. He was awarded “Person of the Year 2013″ by Time Magazine. He received a Harley Davidson motorcycle but opted to put it at an auction and donated the proceeds to the homeless. He implemented a policy: “Zero tolerance on sexual abuse” among the clergy. My facility for words were not that abundant, or I’ll run out of words to describe the impact of his visit to the country and to myself. Only two things. Gratefulness and Hope. I am grateful of the chance to know more of God through him and hope, that he is heaven-sent to help me rediscover my authentic self.